The two word phrases starting headlines that gained the most LinkedIn shares on average were as follows (x represents a number). These two word phrases immediately reveal some of the most common content formats and their relative effectiveness. In the results we can identify ‘how to’ posts, list posts, ‘what’ and ‘why’ posts and their relative average shares. We can see that the highest performing two word phrase that started a headline was ‘how to’. This gained almost three times as many shares on average as the next highest performing phrase. The next four most shared phrases were all forms of list posts. These gained more than double the average shares of ‘what’ or ‘why’ posts. We can also see a number of well-shared posts that begin with ‘The’ such as ‘the best’, ‘the new’ and ‘the future’. We decided to look a little deeper and extended our analysis to look at the top three-word phrases that start headlines. The data was as follows (x represents a number). The results reinforce the dominance of ‘how to’ posts and list posts as content formats. We start to see in more detail how these formats are used in a business context. For example, the way list posts are used through phrases such as ‘x ways to’, ‘x things you’, ‘x tips to’ and ‘x steps to’. These appear to be more practical and informative than the way list posts are often used in a B2C context such as ‘x stunning pictures’. The dominance of ‘how to’ and list posts was no surprise: I see this pattern with many B2B sites. For example, the most shared posts of Social Media Examiner and our own BuzzSumo blog are equally dominated by list posts and ‘how to’ posts. See the most shared posts on Social Media Examiner in the last year. The findings also identify other well-shared phrases that start business headlines such as ‘the future of’, ‘why you should’ and ‘the power of’. We will explore these in more detail below. 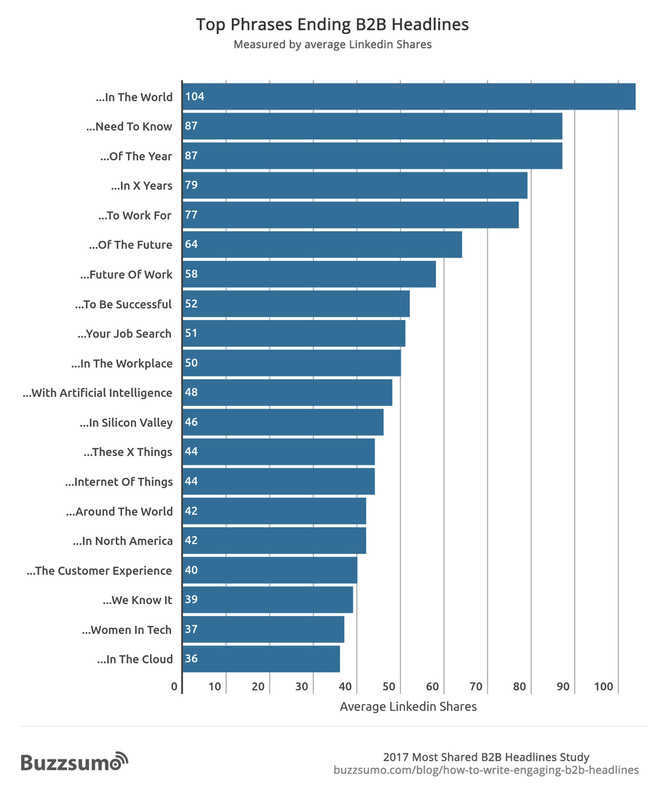 Headlines starting with ‘The’ were the most shared on LinkedIn. This could be effect of using the definite article (‘The’) to reinforce the unequalled value of the content according to Rob Ashton of Emphasis. For instance, a headline such as ‘Ten mistakes you never want to make…’ can be made more authoritative simply by changing the headline to ‘The ten mistakes you never want to make’. This data continues to reinforce the engagement power of ‘how’ posts which received 2,443 LinkedIn shares on average. This is over a thousand more than ‘why’ posts at 1,432 shares. Overall numbers in headlines appear to perform just as strongly for B2B content as they do for consumer content. However, our findings contradict previous research reported on Hubspot that people prefer numbered list headlines over any other type of headline. In a B2B context on LinkedIn it seems ‘how to’ posts outperform numbers. Unlike in B2C where the number 10 outperforms all other numbers by a wide margin, on LinkedIn it appears that the numbers 5 and 10 perform equally well in a business context. Here are examples that had over 5,000 LinkedIn shares. The good news for content writers is that you do not need to be focused on large list content. The wide appeal of list headlines may be a combination of the clear promise e.g. 10 steps, 10 images etc., and the scannable nature of a list post, where you can quickly skim the headings to decide what you need to read. 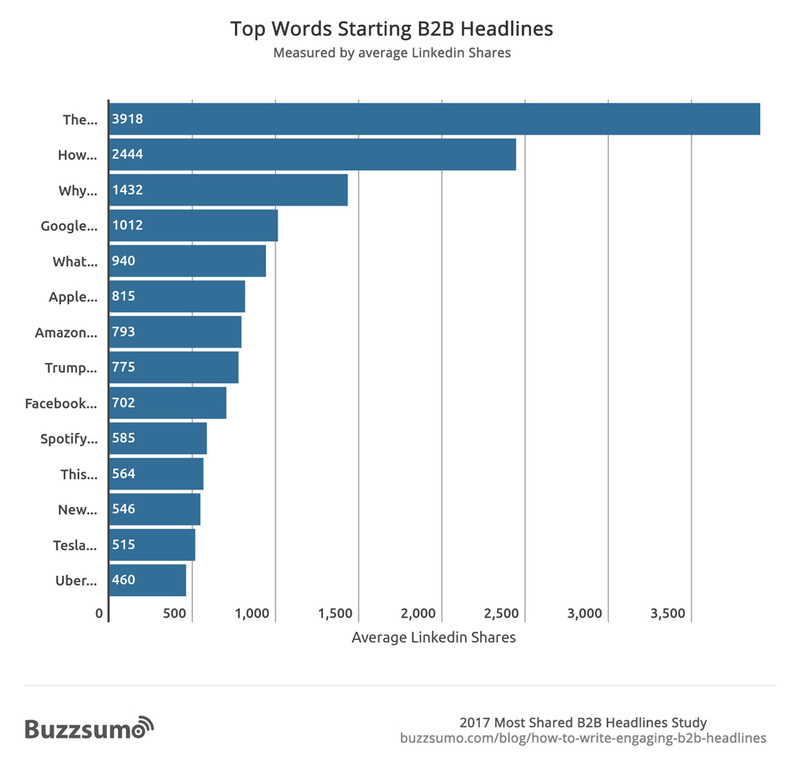 We also looked at the most shared phrases on LinkedIn that end B2B headlines. However, we found that the phrases that end headlines had a far more limited impact on average shares, as we can see from the table below. Thus it would appear that the common phrases that start headlines are much more significant than those that end headlines. Next we look at the most engaging phrases overall in headlines. 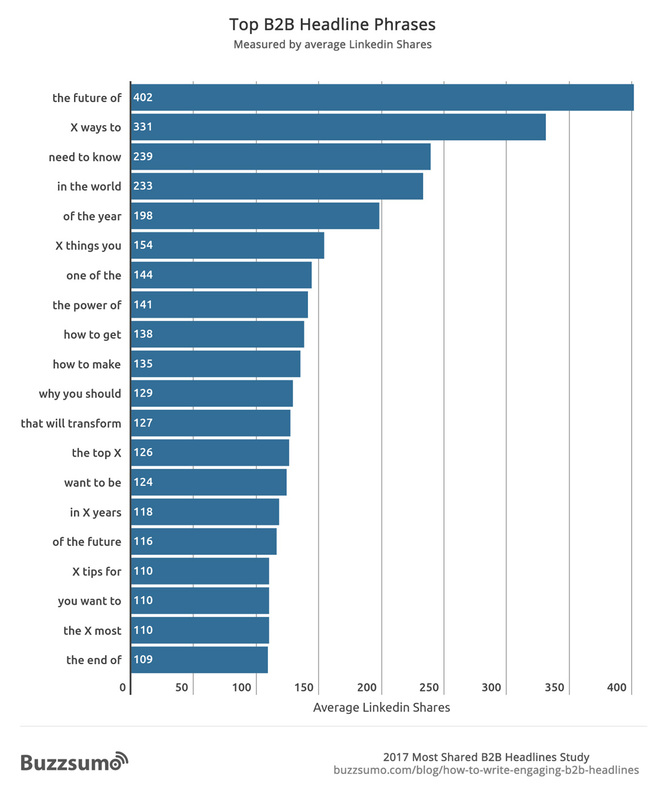 The top phrases that gained the most LinkedIn shares on average, regardless of where they appeared in the headline, were as follows. Note: In our analysis above we only included three-word phrases that were used on at least 100 unique domains. Thus there will be phrases with higher average shares but these will not be commonly used. Interestingly phrases like ‘the future of’ gained significantly more shares when they didn’t start headlines. The phrase gained an average of 142 shares when used at the start of a headline but an average of 402 shares when used in the middle of a headline such as Why 3D maps are the future of autonomous driving. This may be its power as a linking phrase that emphasises both the start and end of the headline. This would fit with our finding for Facebook headlines where the phrase “will make you’ was the top performing phrase. Again it is a linking phrase which links two things together and emphasises both the beginning and the end of the headline. It may also be that adding ‘how’ or ‘why’ in front of the phrase provides more context and imparts more advice and insight. As a reminder of how different the top B2B phrases are from the most shared headline phrases on Facebook, here is a comparison. 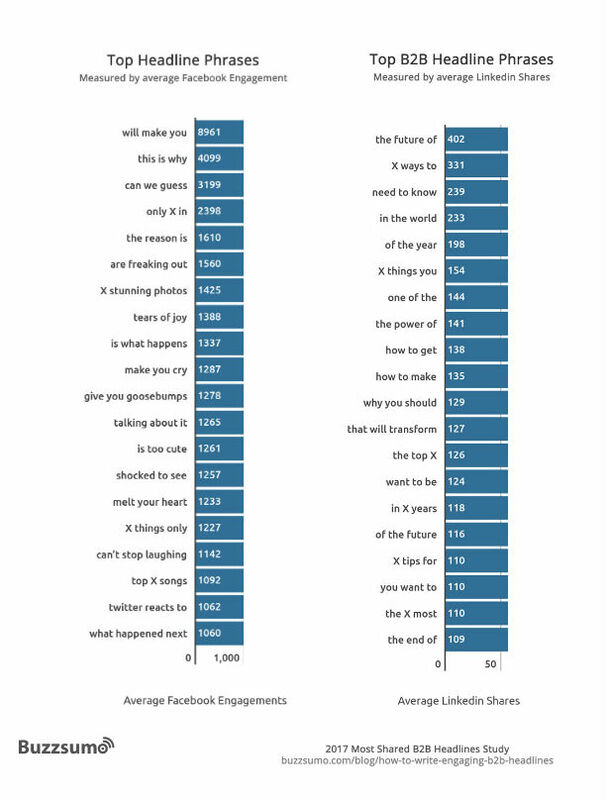 What is immediately apparent is the emotional appeal of the top Facebook phrases compared to the top B2B phrases. The top business phrases are more focused on practicality and industry insights as we might expect. When we analyzed the top two-word phrases we began to identify popular business topics. For example big data, Elon Musk, artificial intelligence, content marketing, silicon valley and machine learning. See the top two-word phrases below. It is important to note that many of these two word phrases are components of the popular three word phrases we have already identified, such as ‘the future’ and ‘future of’ and ‘x ways’ and ‘ways to’. The data shows why it is important to track trending and in-vogue topics. They often become the topics everyone is talking about and this helps generate additional engagement. Current examples include big data, machine learning, artificial intelligence and content marketing. 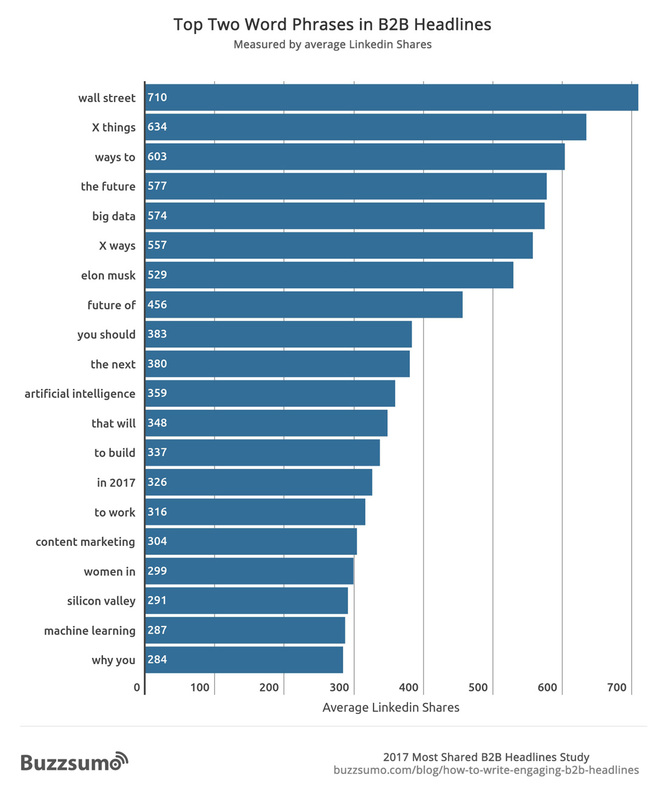 Below are the single words that received the most LinkedIn shares on average, which did not start or end headlines. Again it is important to note that some of these words are part of popular two or three word phrases such as data and ‘big data’, future and ‘the future of’. By contrast the emotional phrases and tribal phrases that perform well on Facebook do not appear to resonate with B2B audiences, or at least they do not appear in the most shared headlines we analyzed. These words not only relate closely to business topics as we would expect but to being successful and improving your performance. These are not dissimilar to the words you might expect to see on business books in an airport bookshop. They are primarily aspirational words. Our previous headline research found that headlines with 15 or more words received higher Facebook engagement on average. However, we found that the optimum number of words for generating LinkedIn engagement is much lower at 7 to 12 words. See the chart below. 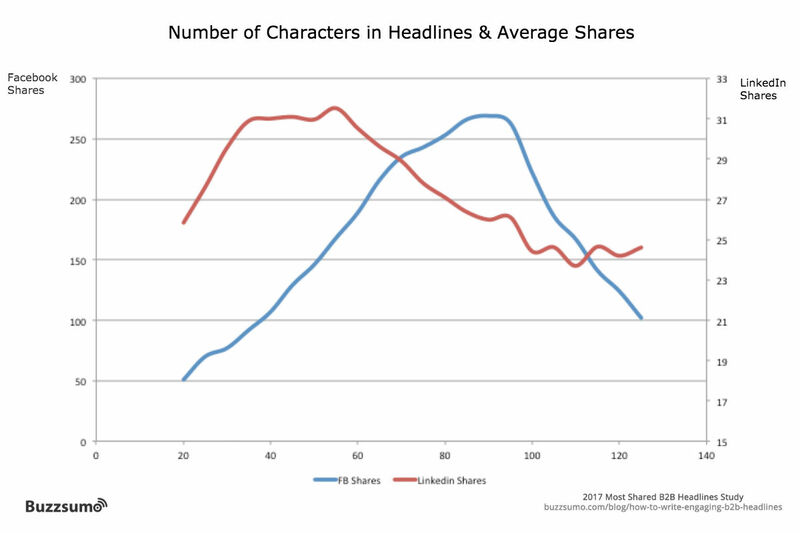 We have set out below two charts showing a comparison of the average number of Facebook and LinkedIn shares for different headline word lengths and character lengths. LinkedIn shares are in red and Facebook in blue. 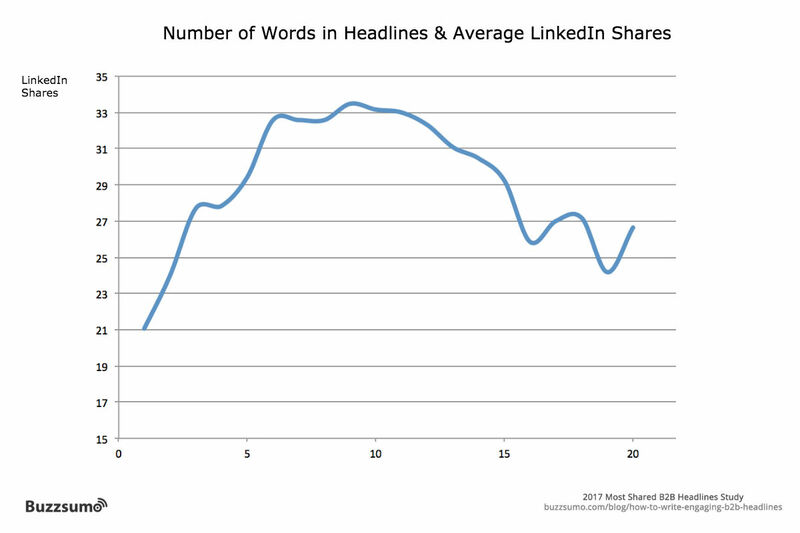 The impact of headline content length on shares appears less significant on LinkedIn than on Facebook. Providing practical content that the reader can apply, based on the high engagement of posts on tips, advice and habits. Many of these principles are similar to those that underpin an engaging B2C headline, but our research suggests that context is critical. Your perfect headline is one that is specifically tailored to your context, audience and circumstances. Writing an engaging B2B headline is not about copying or reusing words and phrases that have previously resonated with an audience, particularly a B2C audience. The groups of words that engage business audiences such as smart, successful, best and top. We discussed the implications of the research for B2B marketers with experts Michael Brenner and Lee Odden. Their reflections were as follows. “If you’re in business, then your business needs to be effective on LinkedIn. This study provides essential insights into one of the most important triggers for attention amongst business people on the social web: headlines. People don’t read, they skim content online and that means B2B marketers need to optimize for attention wherever they can. In fact, B2B brands are competing with 63GB of media presented to each person in the US on a daily basis. Optimizing headlines is an important part of being relevant where and when it matters most. if you want to find out more about using LinkedIn effectively, join us next week for a webinar with Viveka Von Rosen, LinkedIn expert and author. Our research analyzed the headlines of articles that resonated on LinkedIn. 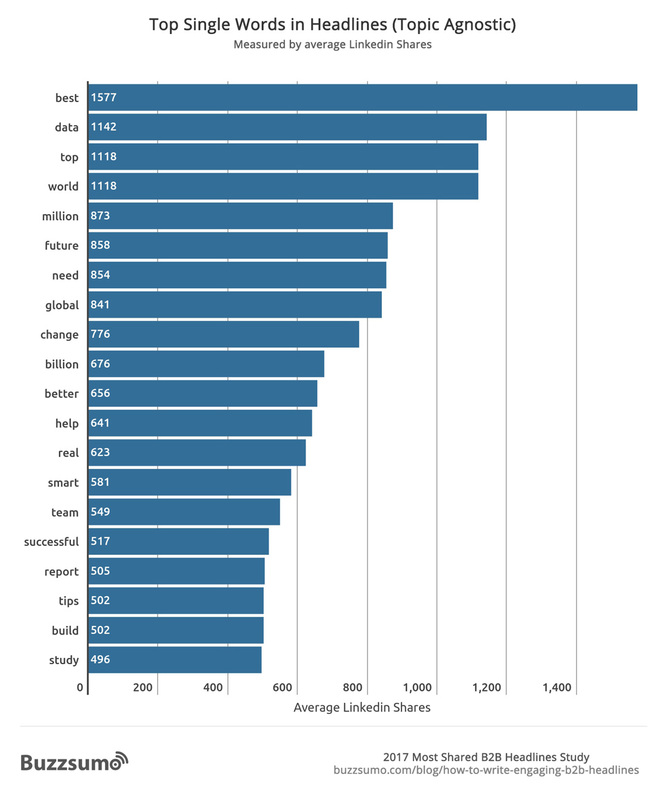 We specifically analyzed the headline phrases, words, numbers, structures and formats that gained the most LinkedIn shares. Our research is based on the assumption that the more LinkedIn shares an article receives, the more it resonates with a business audience or in a business context. LinkedIn is a professional work network so it seems reasonable to assume that the majority of content shared on the network will be relevant to a business audience or at least to an audience interested in work based content whether it is career advice or industry news and trends. This approach allowed us to use LinkedIn as a proxy for a B2B audience. We started with the same sample of over 100 million posts, published between March and May 2017, that we used for our previous headline research. 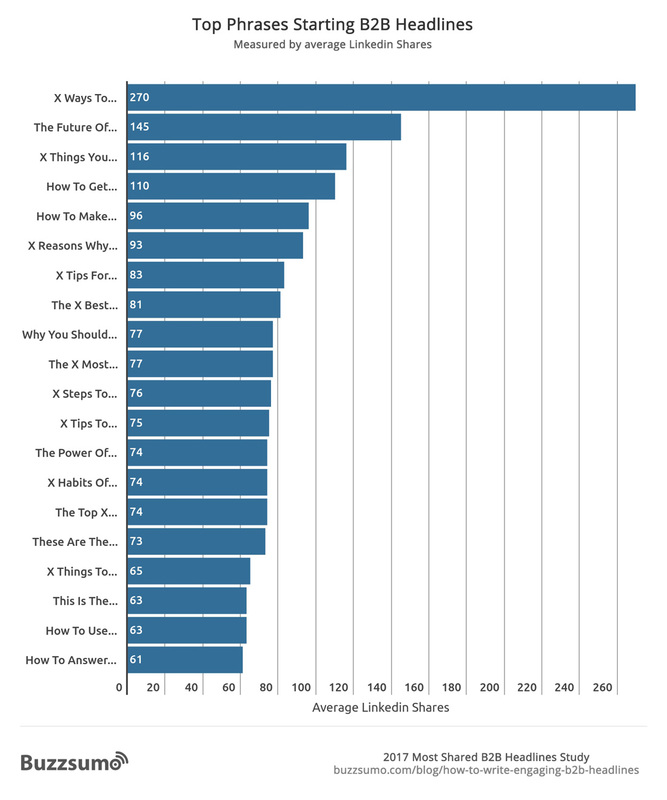 From this sample we analyzed the top 1,000 phrases, words, formats and numbers that were the most shared on LinkedIn. We then calculated the average shares for each phrase, word or number ensuring that there were a minimum of 100 unique domains in each sample. 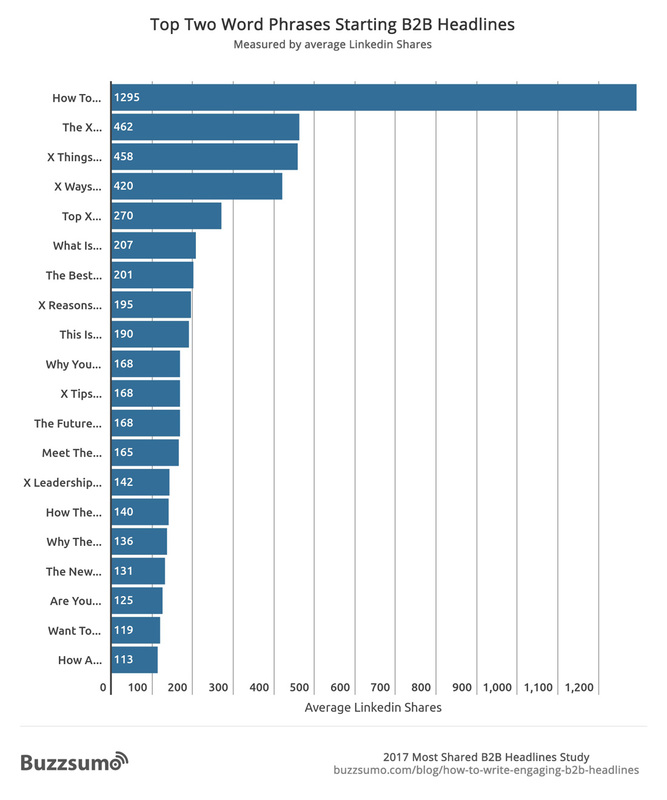 We thought initially that we could simply take the 10 million posts from this sample that had the most LinkedIn shares and use this as a test sample. However, only 7 million articles had at least one LinkedIn share. Thus 93% of the 100 million posts in our original sample were not business content or at least didn’t resonate enough in a business context for people to share it on LinkedIn. Therefore whilst we looked at 100 million posts overall, only 7 million had LinkedIn shares. This meant we needed a larger sample, so we looked at all articles published between January and May 2017 that had at least 1 LinkedIn share. This gave us a sample of over 10 million articles. 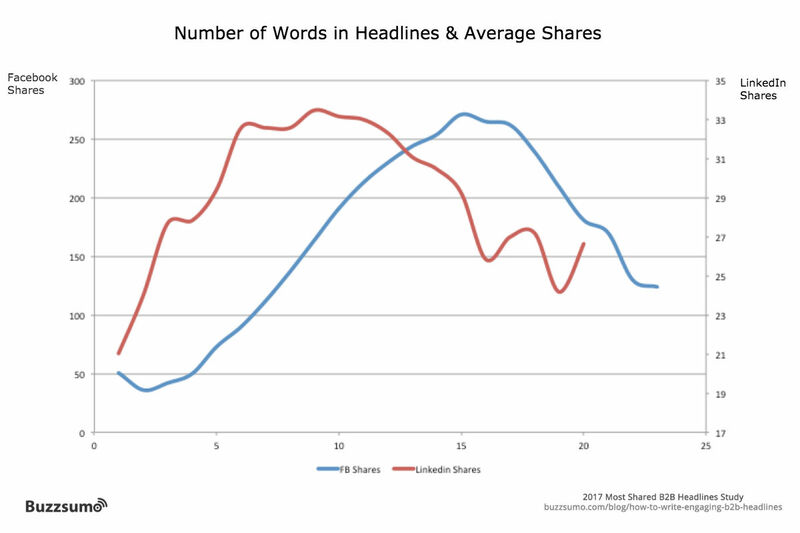 To analyze the average shares of different length headlines (words and characters) we decided to only include headline lengths where we had at least 30,000 articles and where every article had at least 1 LinkedIn share. Our broad assumption was that a post has to be shared at least once on LinkedIn to be of interest to a business audience, if an article received no LinkedIn shares, we didn’t include it in our sample. The final sample sizes for each headline length varied, for example, there were 495,000 posts with 9 words in the headline but only 34,000 posts in our with 19 words in the headline. 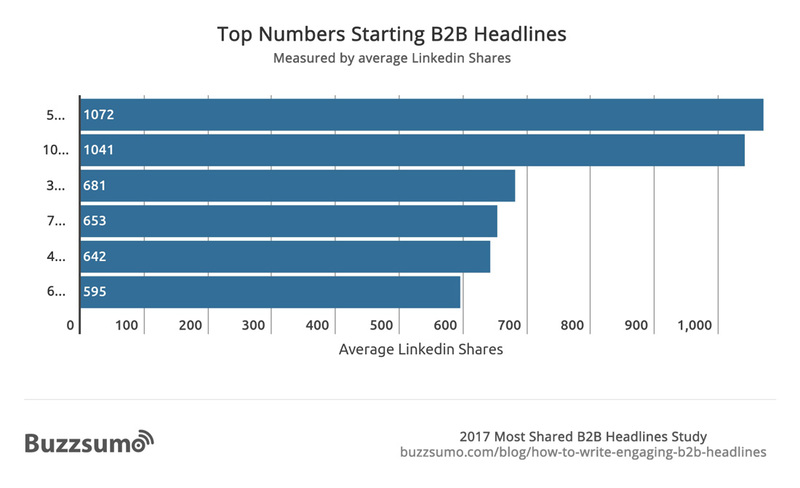 For articles shared on LinkedIn, headline lengths of between 8 and 11 were the most commonly published in the period we analysed. As you would expect as you increased the length of phrases analysed the number of headlines in each sample reduced. The samples for three-word phrases were the lowest, typically 700 to 800 articles. We excluded any three-word headline phrases where we had less than 500 articles. Excellent article. It’s one of the best I’ve read on B2B content headlines. Thanks. Thanks, I think it was interesting to see the data confirm that shorter headlines work better into B2B along with shorter list posts. I think the dominance of ‘how to’, list posts and industry trends was to be expected but again good to see it confirmed by the data. Thank you. Fabulous article and some great insights. Great work! How come you only measured shares, and not likes and comments on LinkedIn? Are there indexing challenges? Hi Gustav, would love to look at data like comments but unfortunately we don’t have access to that data, we only have share data currently. Well done, guys! Thank you! Excellent! Headlines are so important, they are like keywords, they attract attention and drive interest! Hi Melissa, thanks, do let me know if i can help with anything. Headline is very important for article. I have seen also on linkedin. Thank you so much for sharing. Wow this is really helpful! Thx a lot for sharing this. Yes. because How to quickly solves a problem and that is the primary goal of any business. That is why businesses like this word in the articles. Now X things means alternatives or different ways to do one thing. Great insights @steve_rayson:disqus and I found the reason too. Headlines should indeed be magnetic that attract visitors and compel them to click. Powerful and emotional words can make the headlines even more clickable and shareable on social media . This is an in-depth article on headlines in todays online marketing scenario and B2B and B2C is entirely different and every marketer should keep those in mind when ever you craft the content and headlines for your next project. There is no doubt that for both web design and digital marketing, the generation of original and interesting content attracts users and encourages dissemination and participation. Not only create it, but also share it in best places and in the right way helps us reach the desired audience, even as you say, in the B2B. A great article, thanks for the info! OMG, This article opened my eyes regarding headlines. I knew headlines were important but I didn’t know this much. I also came to know how numbers in the headlines can make a difference. Awesome.